They say that Hawaii is Earth’s connecting point to the rest of the Universe. Telescopes—those located on Earth and those in orbit—have allowed us to see deep into the galaxy and to the edges of the universe, sparking our scientific imagination. 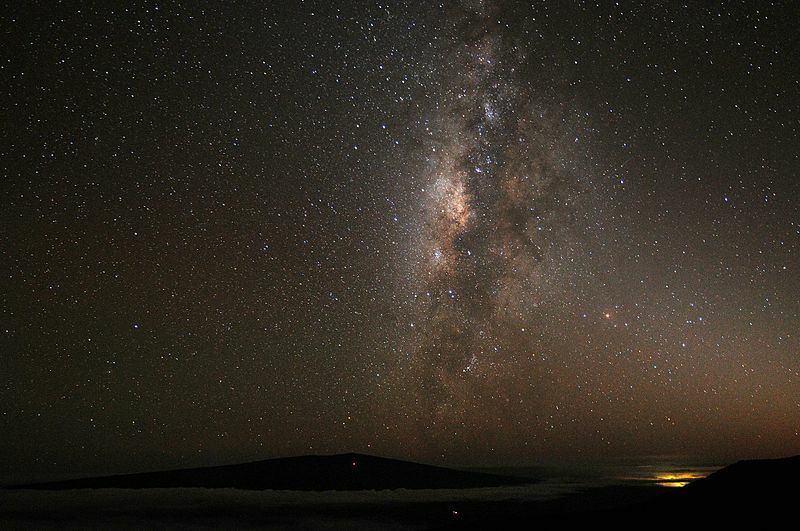 Owing to its low light pollution, its remoteness and sheer height, some astronomers consider Mauna Kea, a dormant volcano on the island of Hawaii, an ideal place to build the world’s most powerful on-land space observatory, known as the Thirty Meter Telescope (TMT). However, for many native Hawaiians (and non-natives alike) Mauna Kea is far more than a convenient place to construct an 18 story telescope—it is the most sacred place in all of the islands. The TMT represents an offense to Aloha ʻĀina, the love of land that is central to ancient Hawaiian cosmology and culture. 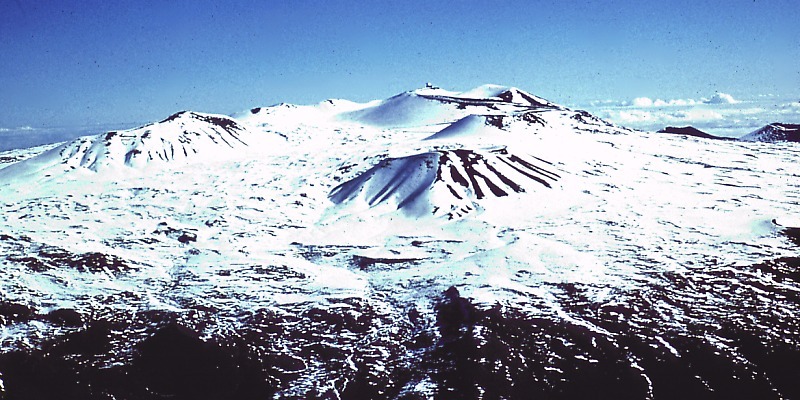 Mauna Kea, the tallest mountain on Earth measured from the sea floor, stands in the center of a fierce battle between the values of modern scientific discovery (backed by the int ense political and financial might of several countries) and the values of Hawaii’s traditional and spiritual stewardship of this sacred place (backed by a growing international movement of “protectors” fueled by social media). Construction of the TMT entails blasting a several-stories hole in the Mauna the size of a 50,000 seat football stadium, and placing endangered species and the fragile ecosystem at further risk. There are already a dozen older, smaller observatories on the mountain, many of which are obsolete, but none of which rival the intrusion represented by the TMT. Funding for the $1.4 billion project comes from Canada, China, India, Japan and the US. 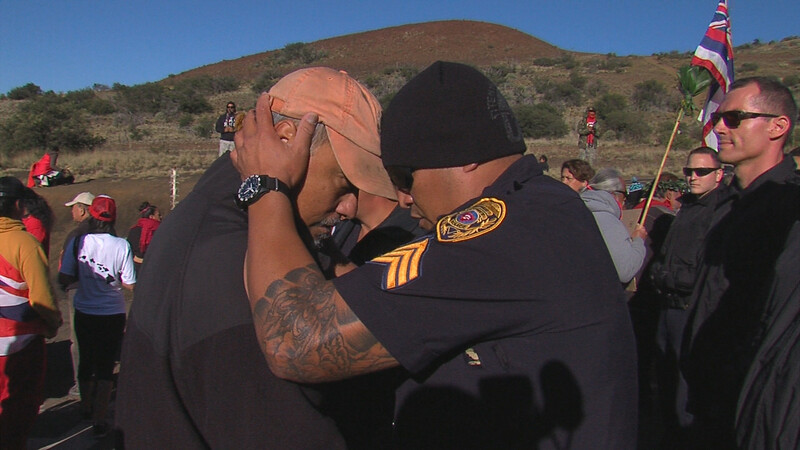 The first arrests on Mauna Kea were emotional for many on both sides. 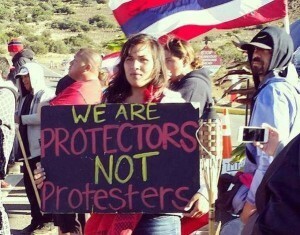 In recent years, a growing number of protectors began holding a constant presence, conducting ceremonies and holding vigil directly opposite the visitor’s station on Mauna Kea. 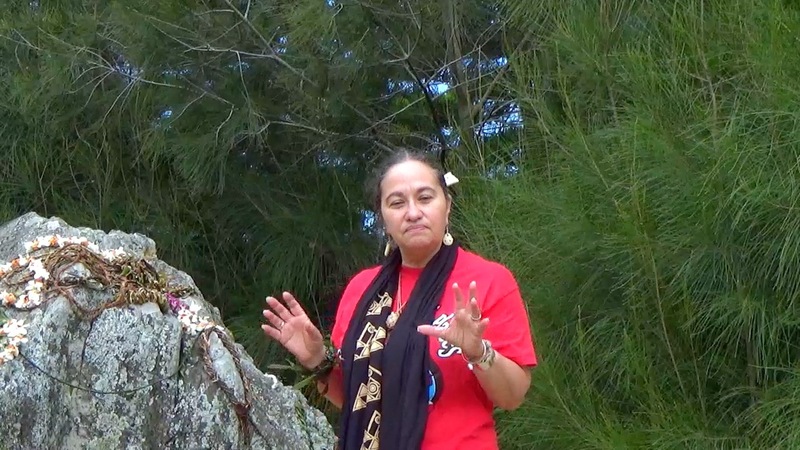 Protectors point out that eventually the TMT will also be obsolete. Even now, a larger observatory is being planned in Chile, and undeniably the best images of the universe already come from satellites in space. 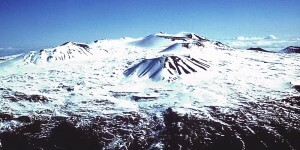 While Mauna Kea may be an ideal location, it is not the only possible choice. 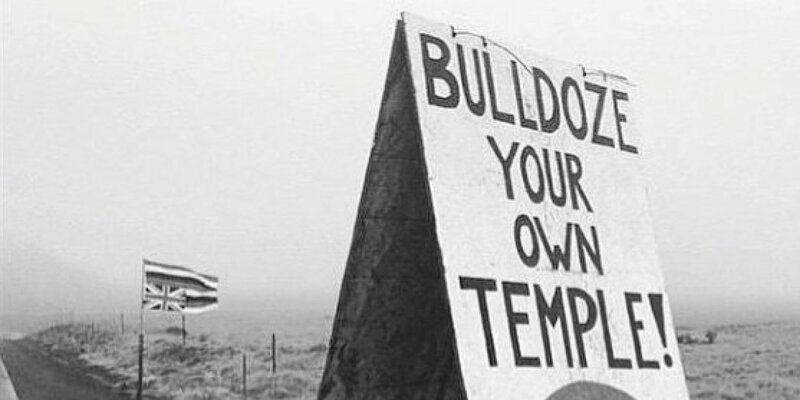 Regardless, all of the legal hoops were jumped or otherwise eliminated, making way for construction of the TMT in March, but plans were delayed by the first confrontation between police and those standing vigil on the mountain, resulting on the arrests of 31 protectors on April 7 2015. Then on June 24, in a showing of traditional Haw aiian solidarity and self-determination not seen since the US annexation of the islands in 1897, 750 people peacefully blocked the path of construction machinery. Protectors formed 24 separate lines of resistance across the road. 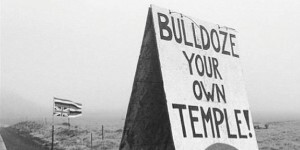 Police made arrests at each blockade, allowing the trucks to inch forward, until they met with a blockade of boulders, at which point they turned back. Solidarity events popped up around the globe, including some unlikely places. “What telescope?” Pua asked her daughter. And so the several-year struggle began. Through the chaos of New York’s climate week and home, I carried with me Pua’s story. Over the next months, the story of the #WeAreMaunaKea protectors exploded globally via twitter and Facebook, and ultimately compelled me to visit Mauna Kea and Pua Case. Like much of traditional knowledge, ancient astronomy was discarded as “primitive” only to be later “(re)discovered” as science using acceptable western technologies. Hundreds of years before Captain Cook sailed to Kealakekua Bay bringing spyglasses, compasses and the like, knowledge of the night sky was already deeply imbedded in Hawaiian culture. In fact, while Europeans were still arguing over whether or not the earth was flat, as early as 300 AD Polynesian and Hawaiian navigators were circumnavigating the globe in double-hulled canoes using their knowledge of the stars. And while star gazing and other scientific knowledge has been historically important in traditional Hawaiian culture—it is connected to the spiritual beliefs and creation stories that spell out humanity’s intimate relationship with the rest of the natural world. Lorilani Keohokalole-Torio, a teacher, artist and advocate for ancestral teachings, believes the struggle isn’t about being agai nst science. “With opposition coming from all sides, the many facets of the movement now has been to take all the issues we are faced with and find balance. 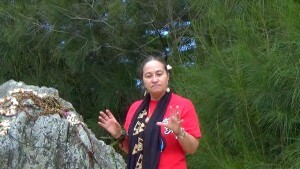 … It’s about Kapu Aloha … taking responsibility for one’s actions.” As Case explains, for the protectors holding vigil Kapu Aloha specifically “dictates how one conducts themselves on the sacred temple, that which is the mountain itself … an order of behavior interwoven into the highest dignity and respect, to carry oneself as if their ancestors were standing amongst them.” An ancient proverb He ali‘i nō ka ‘āina, ke kauwā wale ke kanaka [The land is the chief, the people merely servants] demonstrates the spiritual and moral obligation to protect Hawaiian ecosystems. 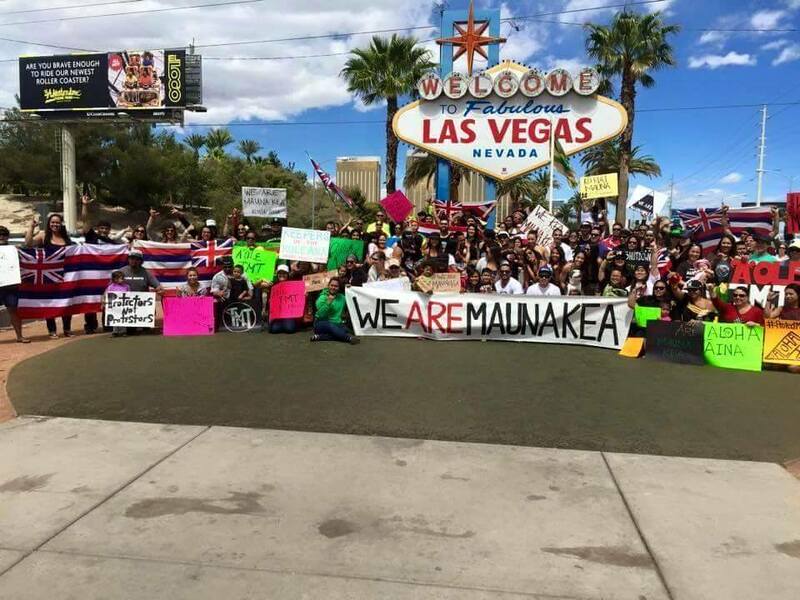 Pua Case is among many things, the founder of Hawaii Warriors Rising, part of the international indigenous Idle No More movement. 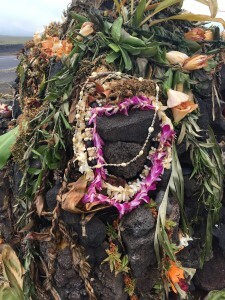 After clearing the debris and placing fresh leis as offerings on the pohaku at Weimea, with cars whizzing past on the highway just beyond a slim row of trees, I watched as Pua Case offered a prayer to the beings that dwell on what a visitor could be forgiven for identifying as an ordinary rock. There are no markers other than the leis to indicate the specialness of this place. “My child was open,” says Case of her daughter’s ability to see and communicate with the water being warning of the impending TMT. 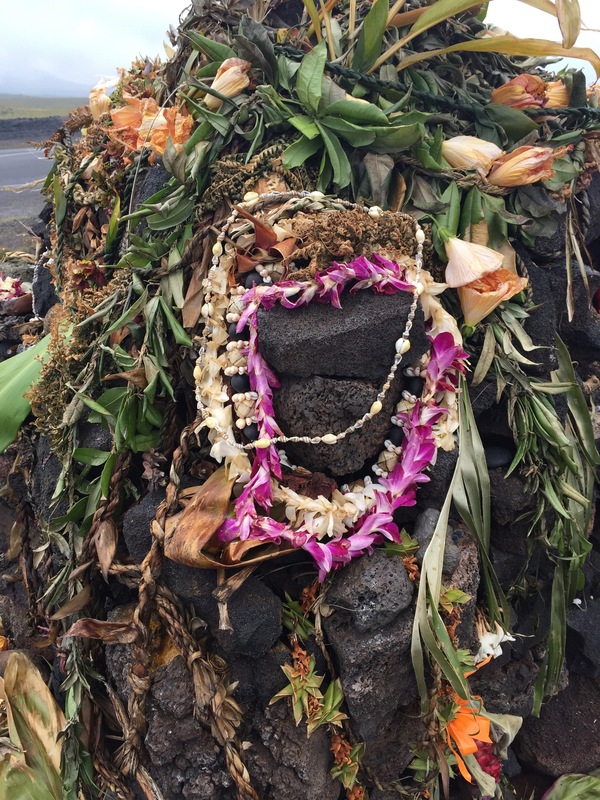 “She had not ‘learned’ [to reject spiritual connection with nature], her mind was not colonized.” She explained that Mo’o I Nanea is the name of the water spirit of Lake Waiau near Mauna Kea’s summit that comes down from the summit occasionally to sunbathe on the Waimea pohaku. 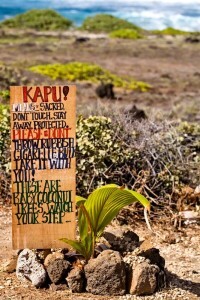 The truth of Kapulei’s visions were never a question for her or for her community. From 2009 to 2015 six petitioners including Pua and her family (the Flores-Case ‘ohana) entered into a court case, with The Flores-Case ‘ohana acting on behalf of the spirit world and Mo’o I Nanea, the water spirit. “In court, we lost. Everytime. And we understood that would most likely happen,” says Pua with a gentle shrug. 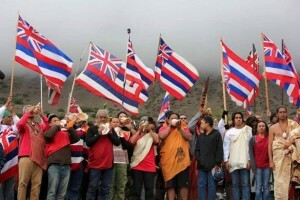 “The courts are not set up for us, especially when money is involved.” They lost not only on the spiritual claim, but on the basis of environmental protections; Mauna Kea is designated conservation land. 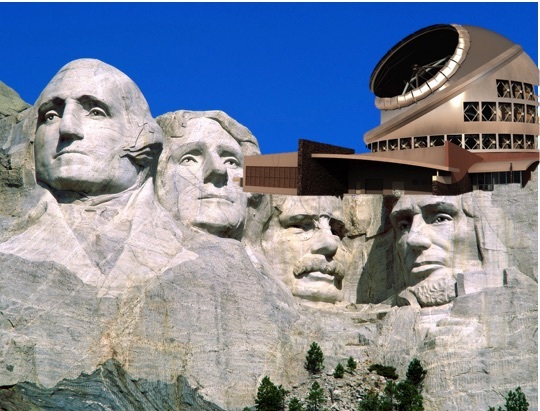 Despite this, over many years 13 telescopes were quietly built on the summit, and even officials concede there were clear violations of conservation and native sovereignty laws. Funds were sent in from around the world to pay for portable toilets for the protectors. Those toilets were removed by the Department of Land and Natural Resources in further retaliation for the June 24th blockade. Respecting the mountain means protectors are guided to find other methods to take care of their bodily needs. The snowy reprieve from construction was brief, and to add insult to injury, the next police action came on July 31—the Eve of Hawaiian Sovereignty Day. 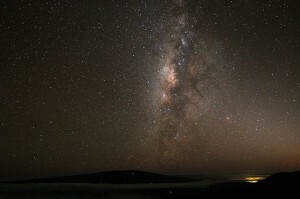 The raid took place in the middle of the night on Mauna Kea, and in Maui, where another telescope is being erected. 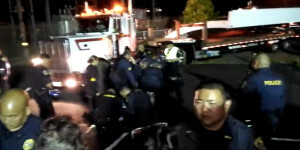 Protectors in both places peacefully chanted and laid their bodies before the trucks, carried off one by one by groups of police. A total of 27 were arrested. To support the protectors, visit their Facebook site and leave your own message of solidarity, which helps fuel the community’s spirits, or you can order a Protect Maua Kea shawl. 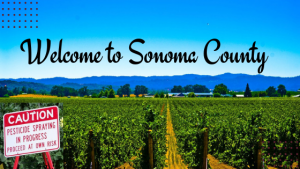 Previous PostAre California Communities Running out of Water – or Democracy?